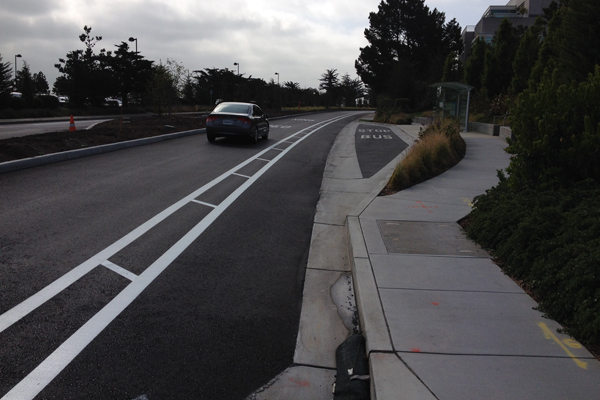 Buffered Bike Lanes in South San Francisco! While Rotterdam just completed its amazing Green Connection project and Copenhagen is almost done with its admirable Bicycle Snake, South San Francisco just got its first buffered bike lanes. Yes, it’s pretty lame when you are comparing it to those inspirational projects, but it’s a great feat for such a place where it’s a ghost town after 6pm. So, kudos to South City! 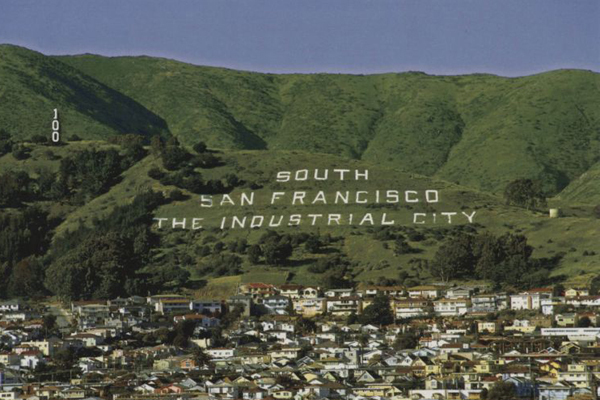 For those of you that don’t know South San Francisco, it’s actually a neighboring city south of San Francisco (not part of SF) and it’s known as the Industrial City. It’s the birthplace of biotechnology and it’s basically an office park where freight trucks, delivery trucks and cars are all you see. The city is mostly comprised of very wide streets with speed limits upwards of 40 mph/64 kmh, and barely any pedestrians strolling on narrow sidewalks. 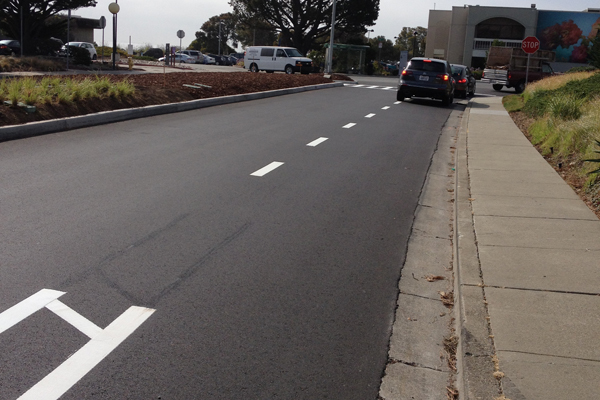 So, it’s surprising to see a road diet of a street of 4 car lanes into 2 car lanes on Forbes Blvd. 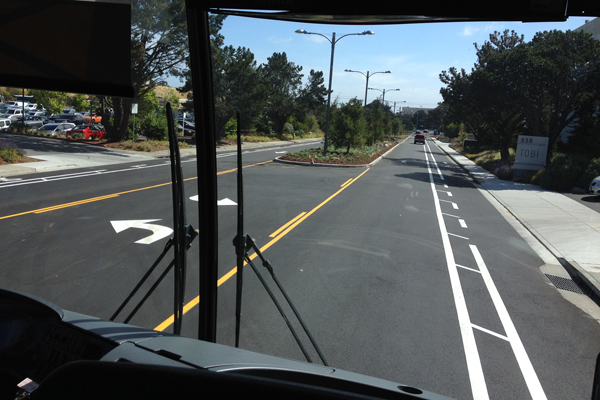 The road diet starts at the cross street of DNA Way and ends at Allerton Ave. And to top it off, the city added buffered bike lanes- the first of its kind in South San Francisco. Pretty cool, eh?! I have never ridden on such a smooth paved street in the States for as long I can remember. I know this is not going to last though because after awhile, the condition will deteriorate and as you know, we have a lack of infrastructure maintenance. For now, I feel more safe because I don’t have to look down on the road for cracked pavement or potholes. I can have my full attention on the road ahead. And as a matter of fact, you will find yourself riding faster. Also, the buffer zone makes me feel safe as well. 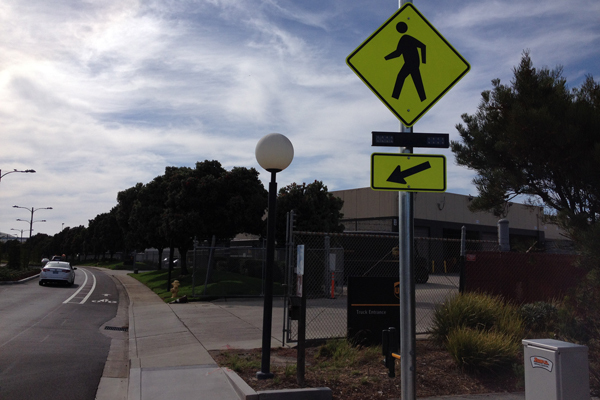 A few of these pedestrian signals are installed. You have to press a “beg” button to cross. However, it’s too bad that the speed limit is still posted at 35 mph/56 kmh. Does it make any sense on a 2 car lane street? You have a road diet, with wide medians to calm traffic, and new crosswalk signals installed; and still the speed limit is at 35 mph/56 kmh? At least, install a protected barrier on the buffered area of the bike lanes. Moreover, when you reach the intersection, you have to share the space with autos. Forbes Blvd and DNA Way intersection. 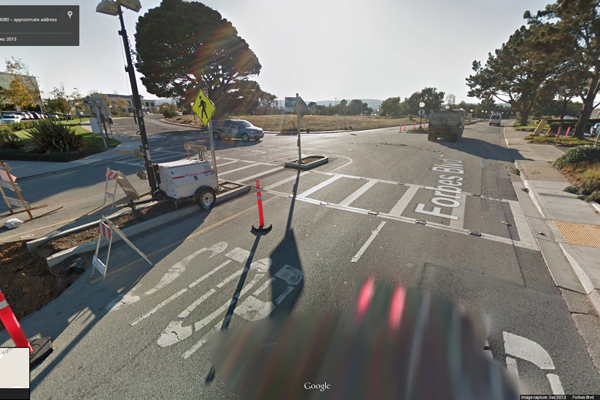 Lastly, the buffered bike path should be extended all the way to the Caltrain station (see blue arrow in bottom image). It’s a logical next step. This will provide a safe passage for the last mile commuters. I truly hope the city is working on it. Green arrow: beginning of new bike path. 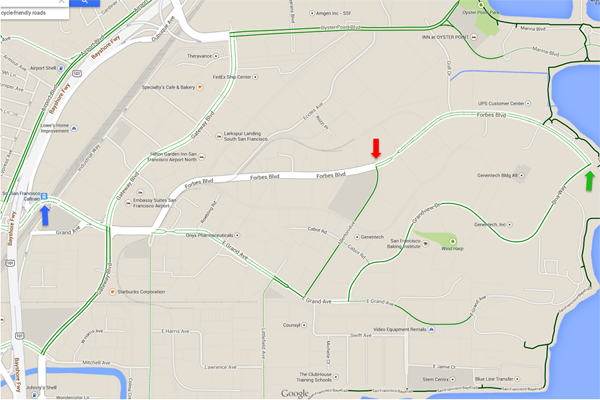 Red arrow: ending of new bike path. Blue arrow: need to expand to Caltrain, public transit system in the area. This is at the intersection of Forbes Blvd. and Allerton Ave. This is how it used to look before the road diet. Courtesy of Google Maps.